For Indigenous Peoples, Is Full Participation in “We the People” Progress or Assimilation? Steve Newcomb (Shawnee, Lenape) and Mark Charles (Navajo/Dutch) are both outspoken critics of the Doctrine of Discovery, an expression of Christian superiority and the forerunner to Manifest Destiny. Their critiques take them in different directions. Newcomb emphasizes that Native peoples and nations need to move toward a free, independent and sovereign existence, while Charles emphasizes moving toward indigenous equality in American society. This clash of views came into focus after Charles made a TED Talk on the Doctrine of Discovery earlier this year and Newcomb criticized it in an editorial. It should come as no surprise that indigenous leaders hold differing opinions. Yet as non-indigenous people look to follow indigenous leadership in truth telling and healing around dismantling the Doctrine of Discovery, such differing views create a challenge to understanding what it means to be an ally. A U.S. District Court Judge in Texas has ruled the Indian Child Welfare Law Act (ICWA) unconstitutional, calling it a race-based policy. The decision could reverse a 40-year-old federal law to protect indigenous families and cultures. Expect an appeal all the way to the U.S. Supreme Court. 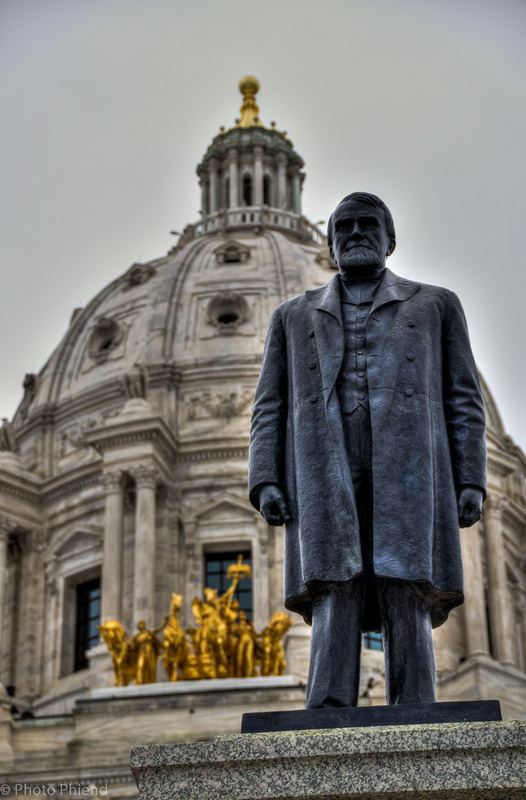 Knute Nelson is not someone who deserves to be honored with a statue in front of the Minnesota State Capitol. On this day in history, Jan. 14, 1889, Congress approved “An act for the relief and civilization of the Chippewa Indians in the State of Minnesota.” Not surprisingly, that’s a euphemism. The act did not provide relief. Quite the opposite, it violated treaties, stole Native lands, and otherwise did great damage to the Chippewa people. This 1889 act is commonly referred to as the Nelson Act, after Minnesota Congressman Knute Nelson who pushed it through. He would go on to become both a Minnesota Governor and U.S. Senator. Though most people probably don’t know it, Nelson holds a prominent place of honor at the Minnesota State Capitol; his statue is on front steps overlooking the Capitol mall. From the 1940s to the 1960s, the federal government pursued what was known as a “Termination Policy” — an effort to unilaterally break treaties, dissolve tribal governments and reservations, and force assimilation of Native Americans into white society. On this day in history, Jan. 24, 1983, President Ronald Reagan issued a statement on American Indian Policy which explicitly repudiated the Termination Policy, strengthening a policy shift started under Nixon in 1970. This administration believes that responsibilities and resources should be restored to the governments which are closest to the people served. This philosophy applies not only to state and local governments but also to federally recognized American Indian tribes. This Administration intends to restore tribal governments to their rightful place among the governments of this nation and to enable tribal governments, along with state and local governments, to resume control over their own affairs. In a television interview last week, Mr. Watt said Indian reservations offered a better example of the ”failures of socialism” than the Soviet Union did. He also accused tribal leaders of promoting Indian dependence on Federal handouts in order to protect their own positions.